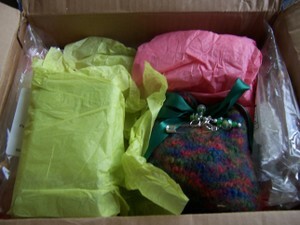 My wonderful tea swap pal Holly sent me a terrific package full of all sorts of lovely treats. Want to see? There was so much stuff that I couldn't get it all in one photo (but that may also have to do with my lousy photography skills). 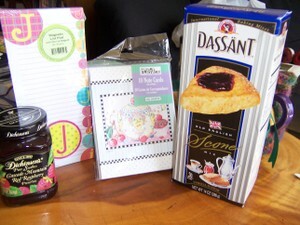 with a lovely tea pot and cozy, there was a matching cup and rock candy stirrers and tea bag rests and scones and jam... note cards and a shopping list. 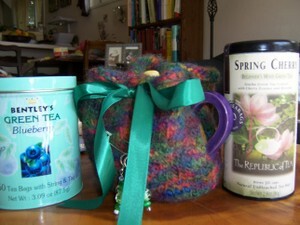 All in all it was a wonderful swap package and I think I am addicted to the Cherry green tea. Thanks Holly!! 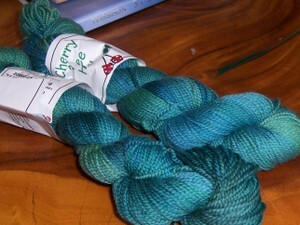 oh, and I almost forgot the lovely Cherry Tree Hill Yarn in greens and blues This will make some fun socks. Well, I thought I might join a swap as a way to get a little mail love. There are still a few more hours to sign up. So pour your self a cup of tea and welcome to my swap questionnaire. 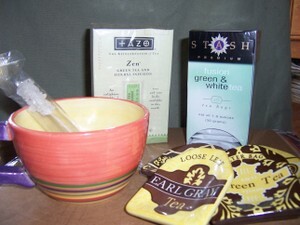 Do you like loose tea or bags, or both – something you want to try? I use both loose tea and tea bags although I find that I often drink my tea at work and so the convenience of tea bags tends to win out. What is your favorite kind of tea (Brand, flavor, variety, etc)? Red Rose tea because this is what my mother always drank. While it isn't fancy or special it is comforting (and you get those silly little china animals in the box) I had a mentee who was from Hawaii and would bring me this great mango flavored black tea - -yummy stuff. For a long time I drank nothing but Jasmine Green tea -- I liked that the jasmine gave it a sweetness without sugar or honey. Favorite color in regards to tea or one you would like to try? (black, green, red, and white) My everyday tea is black although I drink a lot of green tea too. I have never tried the other two colors. Would you say you were a tea pot kind of person or just a hot water heater kind? I usually only make a cup of tea at a time (again I drink most of my tea at work) and don't often pull out the tea pots. What tea accessories would you like but have never purchases for yourself? There are a few things that I could use but to say I would never purchase them for myself wouldn't be accurate. Maybe I just procrastinate -- like my stove top kettle died...like 6 months ago and I have just been heating water in a pot since then. Not ideal but have I gone out and bought a kettle? I could also use a tea ball or a proper strainer for using loose tea in a tea pot since I just have a single cup strainer (that fits a particular cup for steeping right in the cup. If you had to knit/crochet baby booties, a fun fur scarf, or a fair isle sweater, which would you choose and why? The fun fur scarf is definitely out as the stuff drives me crazy although if one of my nieces asked politely... I would have to go with the fair isle sweater because I love a challenge and am so much about process that I have been known to wait years before seaming so the fact that it would take a while is not a problem. What treat would you consider essential at your tea party? (Sweet? Salty? Scones? Those petite pastry trays with a couple of all sorts of things? Little crust less sandwiches?) maybe those little cucumber sandwiches, or anything involving whipped cream (it is a true weakness) maybe over fresh berries. What do you carry your knitting/crocheting in when on the go? I had one of the original Jordanna Paige bags until it wore out and now throw it in just about anything and there is usually a sock project just jammed in my purse. Favorite childhood birthday party? I love birthdays -- they are the best and my parents always made them a big deal -- we had a birthday fairy who would decorate the dining room and leave a pile of presents for you to wake up to -- kind of like Christmas only more selfish without the mixed messages about baby Jesus (why do we give presents on Christmas?). This was all about you and being the center of attention. But name a favorite -- it would likely have been one with just my immediate family in attendance or one of the luncheons with my grandmother on my birthday shopping spree. Favorite type of scone and jam? While my all time favorite thing are baking powder biscuits, I would have to go with scones with dried fruit in them, maybe dried cherry and chocolate chips or apricot and white chocolate. I am not a huge fan of cinnamon. If you could choose 3 people to have 'tea' with, who would they be and why? (famous or not, living or dead). My mother's best friend Pooka, who taught me about proper tea -- I haven't seen her in over 15 years, and my Irish friends Mary and Pat who hijacked my Irish vacation for a weekend and are some of the funniest people I have ever had tea with (although it would likely lead to a few pints). You've been invited to a tea party, what 'props' will you wear (formal or casual)? Oh, is this the place I can finally wear my grandmother's kid skin gloves? I always liked the stilted formality of gloves when we had to wear them to "Junior Assembly" back in 7th grade. Any allergies/preferences you have or are willing to admit to? None that I know of for allergies and I do prefer natural fibers for yarns.